For chicken lollipop the only trick is turn over the meat. I use panko bread crumbs here. If you want you can use normally bread crumbs. But I prefer panko bread crumbs. 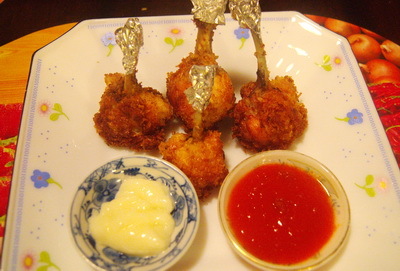 Chicken lollipop is as snack, appetizer or entree. 1. 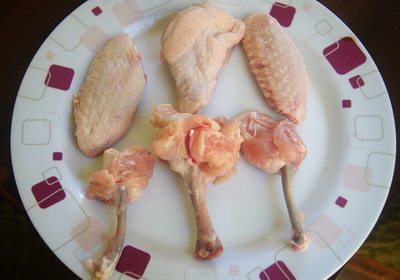 Divide the chicken wing into 3 parts by slicing through each joint. Keep aside the wing top. 2. We will get 2 pieces from each wing. 1 piece is with 1 bone and another one is with 2 bones. Need to turn over the meat like lolly and need to remove 1 bone from 2 bones piece. 3. Add all spices, vinegar and soya sauce and let it marinate at least ½ hour. 4. Mix egg and milk. Dip the wing in it and roll in bread crumbs. 5. Deep fry chicken lollipop till it becomes golden brown. 6. Serve chicken lollipop hot with your favourite sauce. Hey, I am looking forward to making this recipe! I was just wondering if you have a special sauce that would go great with this. I live in NY and we have a restaurant that serves lollipop chicken with this tremendous orange looking sauce. Hoping you would know how to make it. Thank you! Cheers!